← Interview With a Pirate Rat! Everyone who signed up is posting an old blogpost. Here’s my post from July 4, 2011. I picked this post because it’s insane and funny! If the shoe fits . . . well, it sure makes it easier to step into the role of your character. What if you’re a male writing about a female? Stepping into her shoes might be difficult. It can be tricky to balance, especially in spikes. At first it’s awkward. You might fall. Dust yourself off and get back up on those heels. You’ll soon find yourself strutting or prancing through your plot. Does your character need to move with the poise and grace of a prima ballerina? Impossible? Not if you practice, practice, practice. There you go. Much better! Venturing into a new genre, exploring terrain your psyche never dared to conquer before? Those magic shoes could carry you off into mysterious, mystical realms. Try them on. Don’t forget to pay attention to little details. Does your teen female curl her toes when Dreamy Dude flirts with her? What if you’re a female stepping into a male character’s shoes? What kind of stance does he have? Are you taking note of his features, like those hairy legs? With a little creativity (and some black eyeliner – yes, those hairs are drawn on), you’ll be on the right track. Whether you’re a female writing about male characters or a male writing about female characters, in the beginning you might have to tighten the reigns to head them in the right direction. Once they come to life, you could find yourself wrangling with the keyboard to keep up as they gallop down the trail, daring to leap off the edge of the page. Whoa! So, what are we waiting for? Let’s get to work! How do you find a good fit filling your character’s shoes? If you’re participating in the blog hop, there isn’t much time to leave a comment if we’re going to visit all the sites. A simple “Hello Weirdo” is cool with me! Since this is a DÉJÀ VU Blogfest, have you ever experienced a real DÉJÀ VU? Care to share? 56. LD Masterson 112. Alana Garrigues 168. This entry was posted in Authorly Stuff, Humor, Writing and tagged blog hop, blogfest, humor, stepping into character's shoes. Bookmark the permalink. Those pictures are priceless, especially the ballet shoes! So funny. Isn't this blogfest idea cool? I'm doing it too. Love this post Lynn. Wow, a good gang of bloggers blogfesting! I love the quote about the left and right shoes!! Fabulous. I'm number 33 on the blogfest! Nice to meet you, weirdo! Aren't we all? LOL. I love all the different shoes! 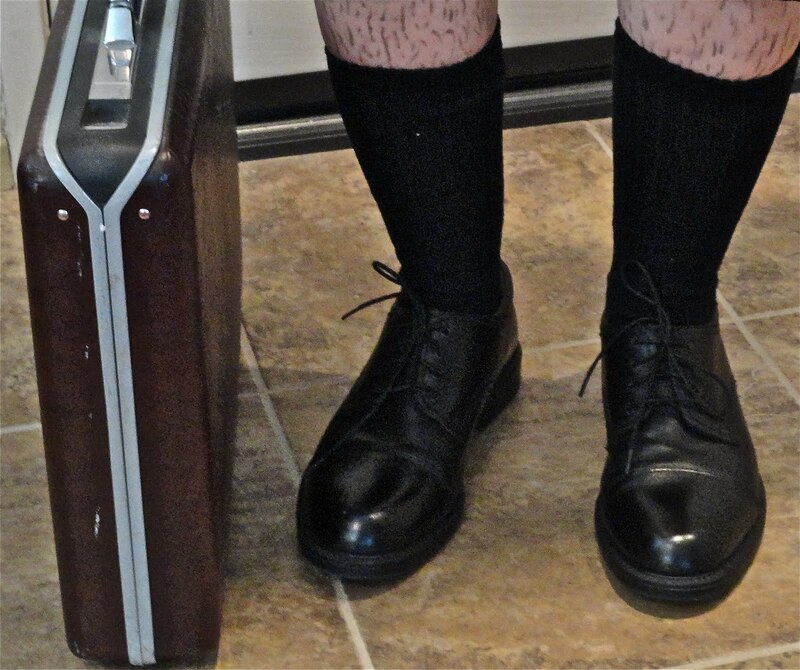 I was startled by the hairy legs and then breathed a big sigh of relief that you were being theatrical and costumed. 🙂 Cute post. Those pictures are…disturbing. LOL. I have to admit, it takes a lot more effort to figure out those male characters. I usually have to run my stuff by the testosterone-o-meter, AKA the men in my life, to see if I've nailed the male POV right. Fun and clever post! I'm blogfesting! Nice to meet you! This made me laugh, loved the post worth re blogging it.Thanks for your visit and comment.much appreciated.Yvonne. What a great post! 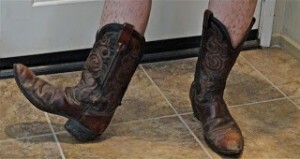 I love those cowboy boots, by the way – sooo cute. What a clever connection between shoes fitting on one's foot and characters fitting you/your story. Brilliant idea! Thanks so much for reposting this! Loved this post, and what a great analogy! Glad I got a chance to read it.Happy to be a new follower! Great pictures!My last completed project had a male MC — the first time I've ever attempted that. It took me awhile to grow into his shoes. (And once I figured out how his shoes fit, I had to go back and re-write the beginning chapters to match the voice I eventually developed. )It takes time to develop your character, whether you are cross-shoe-wearing or not. My advice is don't be afraid to explore, but go back and revise once you get it down pat. All I could think about when reading this post was, "Those poor feet. Ouch. "Thanks so much for joining the Blogfest! Ha ha ha! 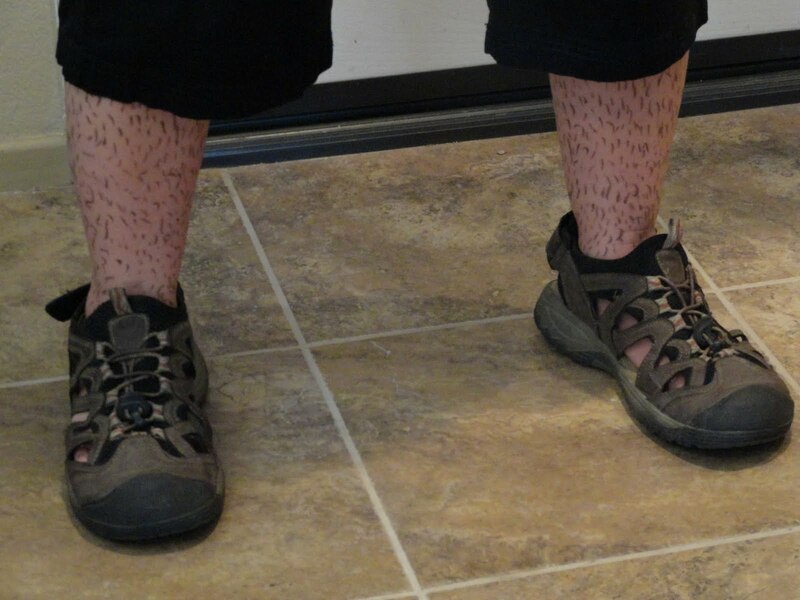 I thought that leg hair looked kind of strange. My first thought was, "Those are SOME freckles!" LOL!Nice legs all round, by the way! You had me at SHOES! Great analogy. Do you think it's weird that I much prefer writing from a man's perspective than a woman's? I've always understood men much better than women. Though I also wrote from a woman's perspective in my book, I am much more comfortable with the guy's POV. My next book will be all male. Hello weirdo, nice to meet you.Love this post. I really need it today. In my current WIP I'm having trouble writing the woman. They guys I seem to have down fine, but this girl eludes me. (She is not like me a all. )I either need to get into her shoes, or let her slip into mine. Thanks.I'll be back. I love this post and the photos are great! It's great to meet you, weirdo. Fun post – I'm glad I got to see it. I know I've deja vu moments, just can't think of them now. Great advice for developing characters too! Great subject and fun photos to go with it – so glad you reposted it. you always crack me up! great replay! The pictures really are perfect. I was sort of freaked out by those leg hairs before I read they were drawn on, though! Hilarious. Great choice for a re-post! Lol! Hello fellow weirdo! This is what I love about Blogfests…is finding new, wonderful people out here. Really nice to meet you! Laura – Haha! Yep, those hairy legs are an eye opener, aren't they? Thanks for stopping by.Old Kitty – I've done that, too, bought heels that pinched my toes but so cute I couldn't resist. I paid dearly for my stupidity! LOL!Coleen – Yes, I think the ballet shoes pics are my favs. I'm so glad you joined the blogfest because it's fantastic!Heather K – Yes, a wonderful group of bloggers in this blogfest. I still have some to visit, but I read a lot of posts yesterday and there are some great posts. So cool!Susie – Thank you! I just found out about the blogfest right before it started, but some people signed up that day, I believe. Sorry you missed it. Heather Day – Hello Number 33 and fellow weirdo! So nice to meet you, too!Eagle – Thanks! The various shoes made this post fun to write.Francine – Thank you. So glad you stopped by!Brinda – Glad you liked the theatrical effect! LOL!LG – That's great that you have a testosterone-o-meter, the men in your life, to run your take on the male characters by! It can be quite challenging.Liza – Thanks! So nice to meet you, too, during this super fun blogfest! Yvonne – Yay, so glad this made you laugh. That's what I was aiming for! Thanks for stopping by!Julie – Thank you! I got those boots at a thrift store! Great deal!Krispy – Thanks so much for the "brilliant"! :)Jennifer – Thank you for stopping by, and extra-special thanks for the follow!Dianne – Thanks for sharing your experience in writing a male MC. I'm glad it worked out for you. I like your comment, "It takes time to develop your character, whether you are cross-shoe-wearing or not. My advice is don't be afraid to explore, but go back and revise once you get it down pat." This is so true! April – Isn't that something that you have boots like these? And 50 pairs of heels? You are a shoe lover. You should do a post about your shoes, boots, and sneakers!Jennifer – Thank you. And thanks for stopping by!Jemi – Thanks! So glad you stopped in! 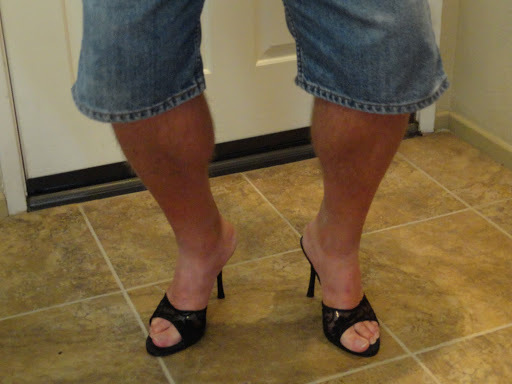 Love this blogfest!Lydia – Luckily the man didn't have the heels on for long! LOL! Thanks for co-hosting this fantastic blogfest!Amy – Haha! I guess strange leg hair gets one's attention! I love how it looked like freckles to you! Jennie – Thank you! I'm glad the analogy worked for you!Empty Nest Insider – No, the model toughed it out with no foot massage! Haha! Nice meeting you, too, through this blogfest. I'm so glad you stopped by!Nancy – No, I don't think it's weird at all that it's easier for you to write from a male's POV. That's what I love about writers, each is unique. Whatever works for you, I say go for it! Thanks for your comment.Jenny (Pearson Report) – These pics wouldn't be the same without those great male legs, so I was a pretty happy camper that he cooperated, as long as I promised not to reveal who he is! LOL! Thanks for visiting!Donna – Thanks so much!Hywela – That's really cool that you're going to write alternating male and female POVs. Wear one shoe of it in your futuristic setting? Heck, why not? LOL!farawayeyes – Thanks for commenting. Best of luck to you nailing that female character's voice. So nice to meet you!Connie – Thank you. So glad you stopped by for the blogfest! Melissa – Isn't it weird when we have a deja vu moment? I had one yesterday when visiting so many blogs, and it was so ironic! Carol – I'm glad the visuals worked for you. Thanks for stopping by.Mshatch – Thank you for stopping by and commenting. Nice to meet you!Angela – Thanks so much for commenting and tweeting! Woo hoo!Erin – Thanks! So glad you got a chuckle out of this post!Tara – Thank you! I'll keep trying to make you crack up!Sarah – Haha! I'm glad you got a kick out of the leg hairs! Thanks for stopping by!Tracy Jo – Thanks so much! Yes, that's what I love about blogfests, too, so many cool surprises along the way! So nice to meet you! Are those your husband's legs? I LOVE this post! Those visual aids are perfect! What a fun post! Reminds me of wearing men's shoes for a part in a play many years ago. I had to wear them around campus to get used to them… embarrassing. Anyway, I think the pictures are the icing on the cake for your post. I dropping by via the blogfest. Great pictures. I like going barefoot. I guess that doesn't bode well for being able to step into my characters' shoes. Cheers. I'm running out of time! yes, I'm a blogfester and I love weirdo's! Love the pictorial post! And so true for writers! I love this! How in the world did you convince him to pose? Or maybe I don't want to know – LOL! Ha ha! Great post. But a very serious point; we do need to experience our characters' lives. I remember this post. Have to admit it was a bit disturbing LOL! Thanks for the repost. I think. Too cute!! And I even had an aha moment reading this. Lightbulb! My male antagonist is going to receive a nice makeover. ;)Nice to meet you, btw! Okay, and people call ME sasquatch with the hairy legs!Funny and true! Diane – I'm not allowed to tell whose legs those are! LOL!Donna – Thanks for stopping by. So glad you liked the visuals!Under Cover – Oh, how funny that you had to wear the male shoes around campus to get used to them! I bet you got lots of looks! LOL!Rawknrobyn – Thanks for visiting my site. Going barefoot is good – hang ten!Green Monkey – Thanks for stopping by for the blogfest! I still have more blogs to visit, too! Sarah – Thank you! The male was quite a good sport, and the female's legs/feet, wearing the male shoes, are mine with the black eyeliner hairy legs! It was a fun photo shoot!Alison – Thank you, and thanks for stopping by during the blogfest!Carol – Thanks! He cooperated as long as I promised not to reveal his identify! Haha!Angeline – Thank you. Sometimes we can learn good details by literally putting the character's shoes on, for sure!Stephen – I remember that you were disturbed by this post. In fact, your comment made me stop and think about whether I should repost it, but then I decided what the heck? Pk – So nice to meet you, too. How cool that you had a light bulb moment reading the post. Good luck with your male antagonist's makeover! I'd love to hear about it!Sasquatch – LOL! Thank goodness for razors!Helen – Oh, thanks so much! Yes, I believe visuals help a lot in proving a point and holding an audience's attention, especially kids.M. Pax – I wore the men's shoes. 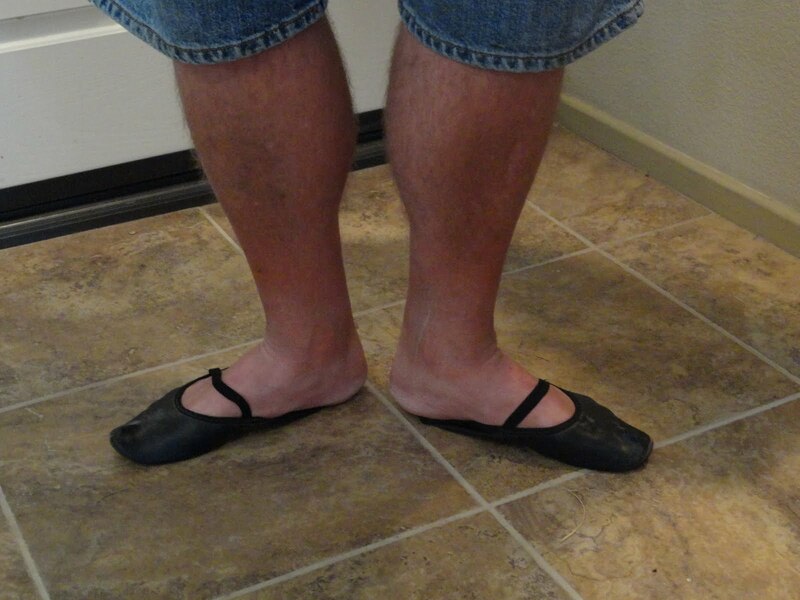 My male model wore the ballerina shoes. Kinda. He couldn't really get his foot all the way in them! Julie – Thank you! Nice to meet you during this blogfest, too. It's such a wonderful blog hop.LTM – Glad the leg hairs gave you a start! That means my exaggerated hairy legs worked in getting people's attention! Nicki – Haha! Glad you liked the pics. Thanks for stopping by! Jennifer – Thank you! Glad you got a kick out of it!